Amnesty International wants to see multinational oil company Royal Dutch Shell go to court. In a report released Tuesday, the human rights organization is accusing the multinational oil giant of complicity in the Nigerian military’s murder of hundreds of indigenous Ogoni People in the 1990s amid protests against oil development along the Nigerian Delta. Now, Amnesty has put together a thorough analysis that includes some previously unreported witness statements and internal Shell documents. The group is also calling for the governments of Nigeria, the Netherlands, and the United Kingdom to conduct a full-blown criminal investigation and prosecution. “The allegations that Shell was, in some way, complicit with the Nigerian military date back to the 1990s,” Amnesty International researcher Mark Dummett, who combed through the internal documents for this report, told Earther. “But this is the first time any organization has called for a criminal investigation of Shell, and that’s because we feel that it’s a scandal that they’ve never been held to account in all this time. 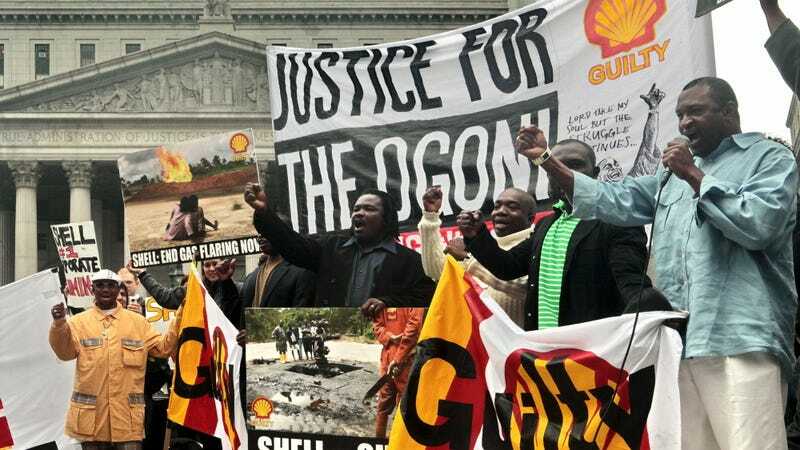 In 1996, ten Nigerians sued Shell for these alleged human rights abuses, including the hanging of nine leaders with the Movement for the Survival of the Ogoni People (MOSOP), which led the anti-oil force in the region. The most notable hanging was of Nigerian author, activist, and MOSOP founder, Ken Saro-Wiwa. The company has always denied these allegations, but it ended up paying a $15.5 million settlement in that case because it believed “the right way forward is to focus on the future for Ogoni people,” as former Shell Director Malcolm Brinded told The Guardian in 2009. Shell maintains a presence in Nigeria to this day, and has been dealing with oil leakages along its Trans Niger Pipeline, which it shut down in July. Without that pipeline, the company also had to shut down a gas plant. Its presence continues to be met with resistance from locals who aren’t reaping any benefits; as recently as April, protestors ran into a crude oil and gas facility to demand jobs and infrastructure development. Really, though, this all dates back more than 60 years to when Shell first discovered oil in what was then still a British colony. By the ‘90s, oil exports made up nearly 96 percent of the country’s foreign income, according to the Amnesty report. The Ogoni, however, saw none of these benefits on their homeland, Ogoniland. the African Commission for Human and People’s Rights. In 2011, the United Nations Environment Programme assessed the continued environmental degradation even further. Indigenous people didn’t want any more oil development on Ogoniland—especially if they weren’t being properly compensated. In 1993, 300,000 people took to the streets in protest. This elicited a military response to supposedly “guard” Shell workers after the company complained about security concerns and announced it would leave the area. Shell never left, though, and this ramp up in so-called “protection”? It ultimately resulted in deaths of nearby villagers and protesters. Shell even paid an honorarium “as a show of gratitude and motivation,” as this internal memo shows, in at least one instance of violence in 1993 where military officers (some of whom were injured and thus compensated by the honorarium) shot at thousands of peaceful protestors. Amnesty International lays out countless instances of military intervention to support Shell resulted in ransacked villages, missing children, and raped women and girls. The group hopes this report will “address what’s been a massive injustice for the past two decades,” Dummett said. And while the world hasn’t seen such severe and outward brutality in many years, violence against indigenous environmental activists is still very much alive across the globe—particularly in Honduras, Brazil, and the Philippines. The Guardian keeps track of these murders in partnership with Global Witness. In 2017, 164 environmental activists have been killed so far. No one’s yet gone to jail for any of these deaths.